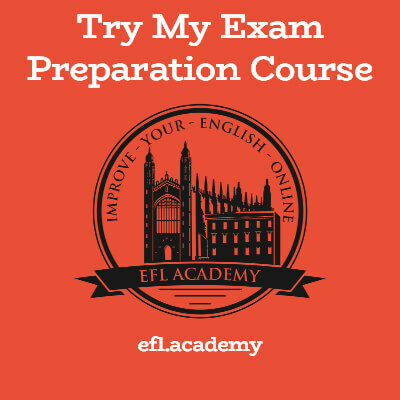 If you read the introduction to the Reading and Use of English exam you'll know that we recommend you start by doing part 4. But so that we don't confuse everyone, these tips will be presented in 'normal' exam sequence. Part 1 is about vocabulary with some grammar. You are given a text with some words missing - you must rebuild the text by choosing the correct word from a choice of 4. To make it even more fun, the 4 choices are usually quite similar. Nothing prepares you for the Reading test better than reading. Read a lot. Candidates who often read in English (for work, for fun) find this part of the test manageable, while those who never read tend to find it very hard. If you are 100% sure that two of the 4 choices are completely identical, then neither can be the answer. There is always only one word that fits grammatically and has the right meaning. Remember not to waste time thinking of the answer to the example! The missing word is shown right above the headline (in the grey box). Double-check every sentence for prepositions that might link to the missing word. For example: some verbs are always followed by 'for', others are never followed by 'for'. If the word 'for' is in the sentence, it's likely to be important. A great book that helps with this part of the exam is CAE Testbuilder. It has 4 exams inside, but the best part is that it explains why the right answers are right, and why the wrong answers are wrong. Very, very useful. 1) Read the title. It's about black bears. Do you know anything about black bears? (You probably know a lot about black beers, but that might not help here.) Maybe you know that black bears are scary and can climb trees. 2) Quickly read the text. Reading the two paragraphs gives us an idea of the topic - the biologist likes bears and doesn't think they are so scary. 3) Look at question 1. Which option collocates with 'trust'? Maybe you think catch trust and win trust sound good, but you're not sure which one is right. Just choose one and go to the next question. This is a part of the test where we don't want to spend too much time. 4) For question 2 you've decided insight or vision both sound good. You aren't sure which one... until you read the sentence again. It says 'into their behaviour'. Into! That links with insight. 'Insight into their behaviour' - yes, it sounds good. Let's choose that. 5) Question 3 - You have read a lot of texts in English and the only one of these words you have ever seen at the start of a sentence is Contrary. You choose that. Lucky you read all those BBC articles! 6) You look at space 4 quickly, and think the answer must be 'desire' - but you double-check for prepositions. Good idea - it says 'for'. You need a verb that precedes 'for'. Well, bother goes with 'with', not 'for'. Hmm... both 'care for' and 'hope for' sound good. Why is CAE so haaaard? Wait a minute - do bears hope for fruit? Of course not, only humans can hope for things. So care for must be the right answer. Am I right? I hope so! 3 points you're pretty sure about and one that's 50/50. And you didn't waste a single second of time. Great! In part 2 there is a text with words missing. Whereas in part 1 you pick from a choice of words, in part 2 there is no such help. You have to use your knowledge of grammar to produce the right word. Write only one word. One! Only! Cambridge consider contractions like 'won't' to be two words (will not), so that will never be an answer in part 2. Start by reading the title, then quickly read the whole text. This will help tell you if words should be positive or negative. Sometimes more than one word might be possible - for example if 'whereas' fits, 'while' might also fit. Either answer is okay, but don't write both. This is one part of the exam where looking at the answers you get wrong while preparing is a goldmine. In fact, the whole next section is about that. I went through every 'open cloze' test in every Cambridge book I could find and made an Excel spreadsheet of all the answers. The results were very interesting and a little bit surprising. Do you know the grammar rules behind those words? What sort of sentence uses the word 'to'? If you're reading a book at the moment, would it be useful to take a page and see how many times the word 'to' is used, and maybe study those sentences? Yes! I like the way you think! a) If the missing word is at the start of the sentence, ask yourself if a gerund fits. Many answers were -ing forms - having and being were very frequent. b) Of the relative pronouns, the most common by far was which. Study defining and non-defining relative clauses! c) 'With' came up frequently, but so did 'without'. That's why you should read the text as a whole before you start thinking of the answers. d) Similarly, 'if' was very common, but so was 'unless'. Unless means 'if not', so again, reading the whole text to get the writer's opinion is vital! f) Linking phrases! You need to know these for the writing and speaking parts, but if you have mastered the words whereas, although, however, despite, spite (in the phrase in spite of), there are many easy points to collect in this part of the exam. Also but, so, while, and such things. g) Prepositions. Everyone's least favourite part of English. Except Cambridge. Cambridge LOVES prepositions. Look for uses of in, of, by, out, before, after, and all the rest. h) These words aren't the most frequent, but there will be 3 or 4 in your text - no, there, once, even, such, since, it, myself (or themselves etc), what, either, and these. i) The! I was amazed how many times 'the' was the answer. Poor little 'a' was much less common. Try typing those words into dictionary.com - it will give you some example sentences of how the word is used in normal English.